The WSCB are responsible for ensuring that high quality multi-agency safeguarding training is available for professionals to attend. The training function for Children’s Safeguarding is managed through the multi-agency Training Pool. The Pool is responsible for developing, reviewing, promoting and quality assuring training and providing a training pool of trainers drawn from the partnership. This process is supported by the WSCB Training Officer. WSCB publishes an annual safeguarding training calendar. This calendar sits alongside the recently updated training competency framework for partner organisations. 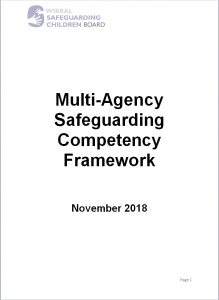 The competency framework provides a baseline for standards of competence that are expected from those individuals and organisations, across a range of sectors, that have a responsibility to ensure that the children, young people and adults they work with are sufficiently safeguarded. It also assists in the development of training packages and provides a framework for performance management. Partner organisations can use this framework to help them decide the relevance of training courses to particular staff groups and individuals. The framework will be reviewed in November 2020. Click on the image below to see the competency framework. In 2015 it was agreed that a more in depth evaluation strategy was required in order to measure the effectiveness of the multi-agency training. Prior to this training has always been evaluated by professionals rating the course at its end on a scale of one to five—with five being excellent. At the end of the course professionals complete an initial evaluation which details what they have learnt from the training. Three months after attending the course professionals complete a second evaluation which details how attendance at training has influenced practice and strategy in their organization. Six months after attending the course a range of professionals attend a facilitated working group to evidence impact of training on outcomes for children and young people and adults vulnerable to abuse, and to feedback how effective the training has been. Feedback from the working groups will inform the review of the training courses undertaken by the Training Pool. This new training evaluation strategy has been implemented since October 2016. Training reports and focus group reports are archived after 2 years but older reports can still be accessed by clicking on the zip folders at the bottom of this page. Alongside the evaluation of learning from the training the WSCB also needs to ensure that training is delivered to the highest standard. We currently have a large training pool of professionals who deliver the training within their area of expertise, with delivery being supported by the Training Officer. Each trainer has one live observation of delivery a year, with written feedback being given, highlighting areas of strength as well as areas for development. This process allows trainers to reflect on their own delivery skills and knowledge, away from the training room.